You probably have thought about following your dreams, haven’t you? Be it your dream to build your own business, your career ambition or any other aspiration. But there is something stopping you, isn’t there? Most people when they get to 35 years of age have lost their dreams, as they try to be practical. And they tend to kill other people dreams too. Do you surround yourself with people who are dream killers or inspirers? Dream killers do it for 2 reasons – either to protect you, or because they envy you for your dreams. Be aware of the dream killers in your life and the kind of people you surround yourself with. Choose people carefully to share the inspiration with, instead of killing the dreams. Be it your dreams to build your own business, your career ambition or any other aspiration. There will always be obstacles in your way of fighting for your dreams or aspirations. They are there for a reason – for you to figure out how to overcome them. If you encounter a high wall and you need to overcome it, how will you do that? Do you say – there is a wall in my way, I don’t know what to do. Or would you try to figure out how to climb the wall? Recently, I heard someone say:” I don’t see the walls, I only see the doors. And if they are closed, I will make a key. And if the key does not fit, I will make another one or ask someone for help to make the right key.” This is what I call, the success mindset. The Success Planner book is one of the keys. There are always ways how to overcome obstacles on the way to following your dreams. But first you need to get crystal clear clarity that the dreams you want to follow are your dreams. Make sure these are your career or business aspirations. Not your parents, not your spouses or someone else’s dreams, but yours. And then – choose the approach that works for you to succeed. You can go and learn a new skill that will help you follow your dream. You can get a coach that will help to further have clarity and commit to actions to build a bridge that will get from today to your dreams. 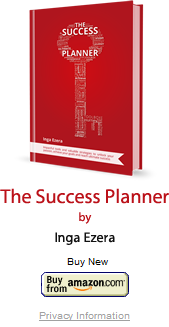 You can get The Success Planner book and do the coaching and goal setting journey yourself and give me a shout if you have any questions @ www.TheSuccessPlannerBook.com or you can use any other approach – whatever works best for you. Whichever approach you choose, make sure you take action.